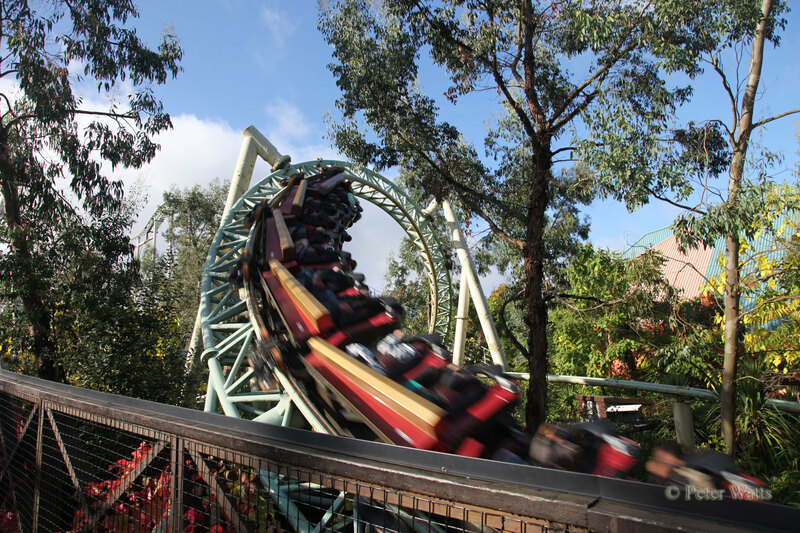 There are few places like a theme park full of roller coasters to give you that 'you spin me right round' feeling, and Thorpe Park is no exception. 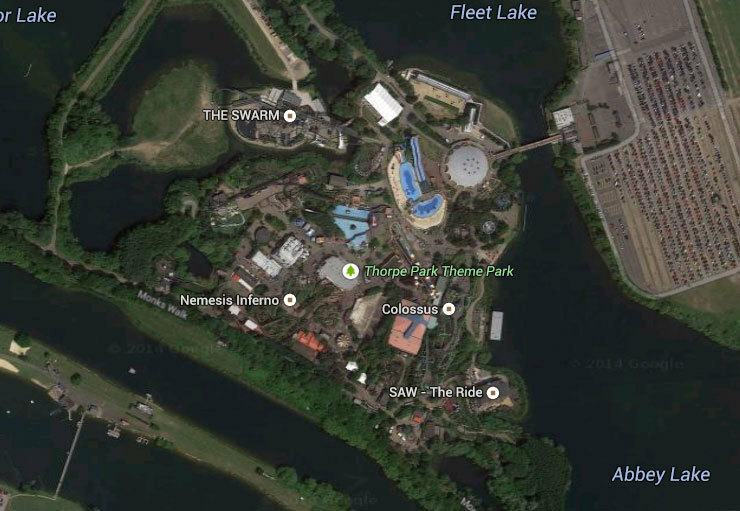 Situated a short distance south of London, the park contains twelve Thrill Rides (the 'coasters and the like) and 14 family friendly rides. It first opened in 1979, built in a partially flooded gravel pit, so it is contained on it's own island surrounded by lakes. New rides and attractions have been added over the years. Like any good theme park, Thorpe Park can be very full at peak times. I spent a day there recently with a friend. We went during the week, on a school day near the end of the season. This meant that the park was really quite empty. So much so that, instead of queuing a hour or so for each ride, we had a rough wait time of just 10 minutes. Or a little longer if we wanted the front row seats (which, of course, we did). We arrive just before the gates opened, waiting with anticipation for them to let us in. We decided to head for the large Thrill Rides first, so that if the crowds grew then we'd have tasted the main ones early on. As it turned out, the crowds never grew, so we simply moved from one to another and eventually had to give our bodies a rest from being thrown around so much. 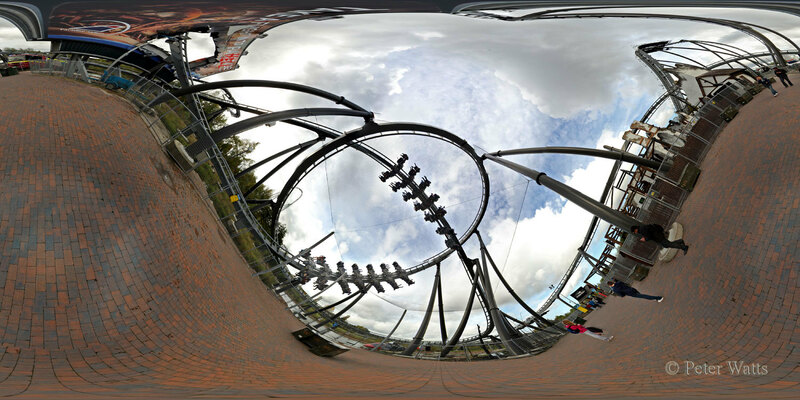 If you want to read reviews of the rides, with some pretty good videos, then check out Total Thorpe Park's site. This is what everyone heads for, the extreme thrill rides, massive roller coasters with zero-G and inverted loops, spins and twists. We were no different, and headed straight for Colossus. Built in 2002, this was the first roller coaster in the world offering 10 loops to riders. In addition to the usual massive loops, riders are flung through a series loops followed by corkscrews. Four in row at one point, leaving you feeling like you have just been through the wash. This may not be the newest ride, but it still packs enough punch to leave you a little uncertain on your feet at the other end. 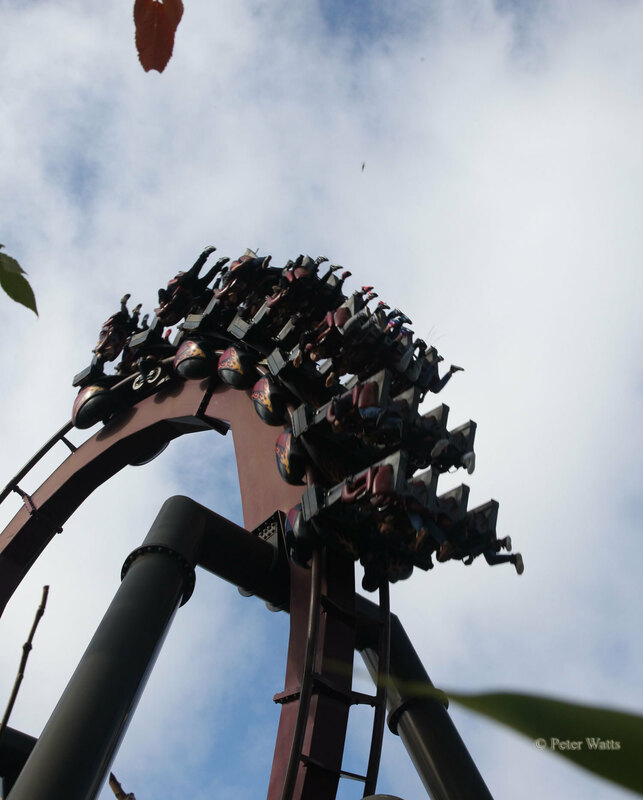 From there we wondered over to the Nemesis Inferno, a ride with four inversions with speeds up to 50 mph. Often billed as one of the best rides of the park, you sit in this with your feet hanging out, which makes those inversions all the more felt! The ride is themed on a volcano, spinning you through lush, tropical vegetation which at times feels scarily close. 90 seconds later it is all over, and again we staggered slightly on the way out. The biggest punch in the park is probably provided by Stealth. Within 2 seconds you are travelling at about 80 mph, catapulted to the top of a 60m vertical climb pulling up to 4.5G's. There you get a (very) brief chance to admire the views, or collect your stomach, before the twisting plunging down the other side. The ride is all over in 20 seconds, but, boy do they count. If Stealth is the fastest ride in the park, then Detonator is the shortest. Just the time to drop down a 35m tower. Actually the suspense is sitting in your seat, feet dangling over the air as you are slowly lifted into the air. Then you are released to pull about 5.5G as you plummet close to 55mph back to the ground. Sometimes they do a count down at the top. And sometimes they don't. Unlike all the other rides in the park, no one screams on Detonator. There is just not enough time and most people come off looking more than slightly shocked. For me, this was the most extreme ride of the day. I am still wondering why I did it twice. Thorpe Park also has a number of water rides which range from the 'get a little damp' through to 'guaranteed soaking wet' experience. On the damp end is a large slide flume, which is just fun, and Storm Surge, which has spinning boats that tend to fill with water meaning your shoes get wet. Heading up in the wetness scale is Loggers Leap, which has the the UK's tallest log flume as you plunge down a 16m at speeds of up to 20mph. The logs hold 5 people, and the fuller they are, the bigger the splash. Some will come out damp, for others…it is change of clothes time. And for a total soaking, head for Tidal Wave, which slides you down a 26m drop into a pool below, where you spend several seconds ploughing relentlessly through a wall of water thrown up by the boat. And, no kidding, as the signs up to the ride say, you will get very wet. Even wearing full waterproofs is no guarantee of protection. Thorpe Park also has a darker side, with some of the rides, like Saw The Ride, having horror themes. There are also a number of fright mazes, all rated for adults only, which, for me, take away from the family fun nature of the park. If you enjoy that kind of thing then look out for the special Fright Night offerings. •	Get there early, for when the doors open, so you can hit the big rides before the queues build up too much. •	Visit on a week day, during school time, and near the beginning or end of season. The weather may not be so good, but the queues are a lot shorter. •	Keep an eye out for special offer tickets, and buy online. Sometimes you can get 2-for-1 entry if you can prove you have travelled by train. •	Bring waterproofs, if you want to be able to enjoy the water rides without shivering for the rest of the day.